It is not uncommon for a speech therapist to recommend Occupational Therapy for certain children. Although speech therapists are working on a child’s ability to communicate effectively, they are also looking at the overall development of the particular child. Often, other aspects of development impact speech and language. In fact, our speech relies heavily on our attention system, memory system, visual system and auditory system. As a result, it’s often useful to have a team or multi-disciplinary approach in therapy to help children achieve their greatest potential. Occupational therapy helps improve various aspects of a child’s development that are directly related to speech and communication. For example, an OT will work with children on their attention and regulation, which helps children to be able to focus and engage, a foundation the use of language. They also work on postural or jaw stability which is critical for speech production. An Occupational Therapist also works on sensory integration that affects oral-motor skills and feeding. They also assist with hand-writing skills needed for written language. It assists with Executive Function Skills that helps the child plan, organize and sequence their thoughts and ideas logically in order to improve overall communication and expressive language. According to the AOTA (American Occupational Therapy Association) children with the following medical conditions might benefit from OT: sensory processing disorders; autism; visual processing issues and learning disabilities such as dyslexia, executive functioning issues and dysgraphia. 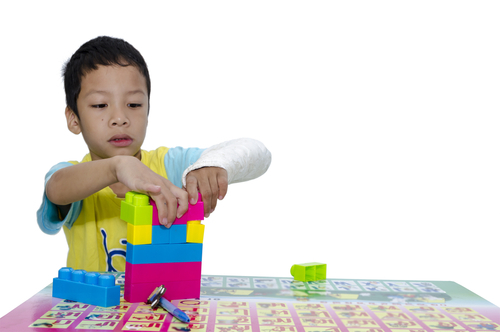 Occupational therapists help children develop a variety of skills that are related to speech and communication. For example, they work on fine motor skills so they can grasp and release toys and develop strong handwriting skills. They also address hand-eye coordination to improve school and play skills such as batting a ball or copying from a blackboard or notebook. The OT will also address self-care or activities of daily living such as buttoning clothes and using eating utensils. They work with children who have sensory and attentional issues to improve focus and social skills. Full body exercises, yoga, animal poses and trampoline play are examples of OT activities that can help certain kids exert enough energy to then be able to sit at a speech therapy session and in a classroom. A team approach of Occupational and Speech Therapy is particularly helpful when working with children who have sensory processing issues and learning disabilities. The OT will help develop needed skills so that the child can self-regulate and focus on their speech therapy lessons. Many experts agree that occupational therapy also helps in treating weakness in coordination and organization, which is often found in children with ADHD, a condition that is often present in children with dyslexia and other learning disabilities. It’s never too late to ask your Speech Therapist about the benefits of Occupational Therapy for your own child and how it may actually strengthen the results of your child’s speech therapy sessions. Studies confirm that the earlier you can provide therapy for speech and developmental delays, the more effective the therapies will be for your child.